WHEN JERRY AND KARI LOCATI TAKE A QUICK GETAWAY from their busy lives in Bozeman, they head straight for their condominium at the Yellowstone Club in Big Sky. “We never call it a condo, it’s really our ski chalet,” said Jerry, the founding principal of Locati Architects. 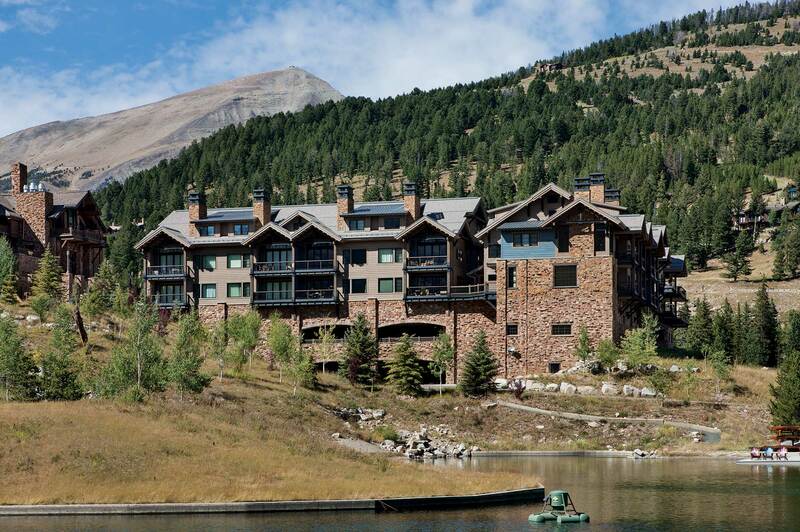 By “chalet,” Jerry was referring to the alpine setting of the condominium in the Yellowstone Club’s private village, just steps from the Warren Miller Lodge. Proving that size doesn’t matter when it comes to luxury, the 2,700-square-foot residence is filled with custom details that set the scene for the ultimate retreat. Serene views of Eglise Mountain and the lake connect the living space to the surrounding landscape. Considering that Locati Architects is best known for expansive luxury homes that average more than 8,000 square feet, that’s quite a statement. 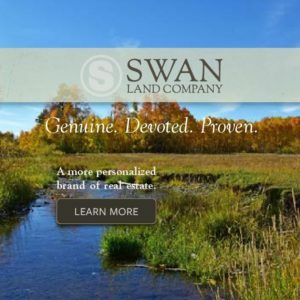 His firm designed the three-story building wherein the three-bedroom condo is only one of 23 units. Starting with a bare unit, Jerry and Kari worked with Locati Interiors principal Amanda Heyes and her team of designers to maximize the unit’s amenities in order to create a unique vacation home. Built like a loft, the primary living space is an open floor plan encompassing a great room, dining area, and kitchen. The condo’s narrow footprint, with 9-foot-high ceilings and a single source of natural light at the southern end of the unit, presented design challenges. The Locatis and Heyes decided to create more visual separation between the spaces by adding texture and dimension without claiming too much square footage. Simple lines and neutral colors were key elements in achieving an elegant flow. 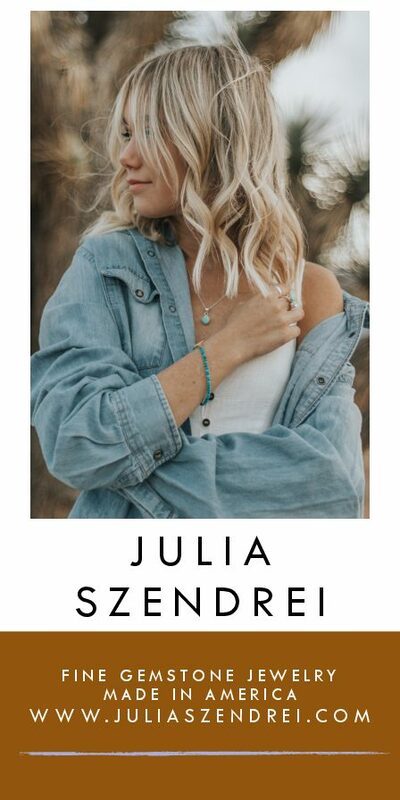 Essential elements include stone and reclaimed timber accents that look structural, as well as a drop ceiling in the kitchen to separate it from the dining room. Contrasting with the bright white kitchen, the dining area is anchored by an aqua-colored velvet banquette that offers additional seating in an original form, with tufted detailing that continues up the wall to the ceiling. On the opposite wall, a cocktail bar adds visual interest and a practical utility. “The mix of stone and wood details are reminders that contemporary design can be paired well with rustic design,” Heyes said. 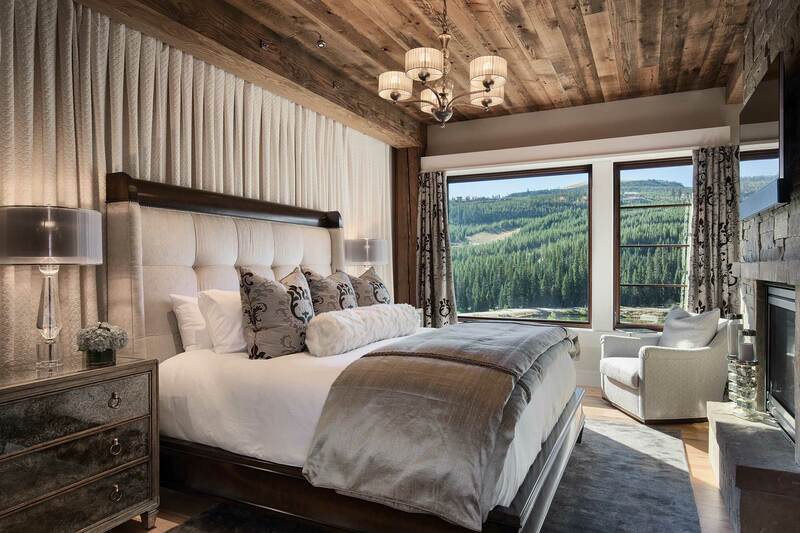 Compared to other residences that Jerry and Kari have designed together, the ski chalet is in more of a contemporary style than traditional or rustic, yet delicate flourishes — such as antique mirror trim and unique lighting to separate living spaces — keep the home from seeming austere. Heyes accentuated the clean-lined furniture by layering textured fabrics and subtle patterns into the floor coverings and upholstery to create what she calls a “mountain cozy” style. With entertaining in mind, Jerry asked Heyes to design a sectional couch and seating area that could comfortably accommodate just two people or a room full of guests. The result is a space where friends and family can easily be together without feeling cramped. 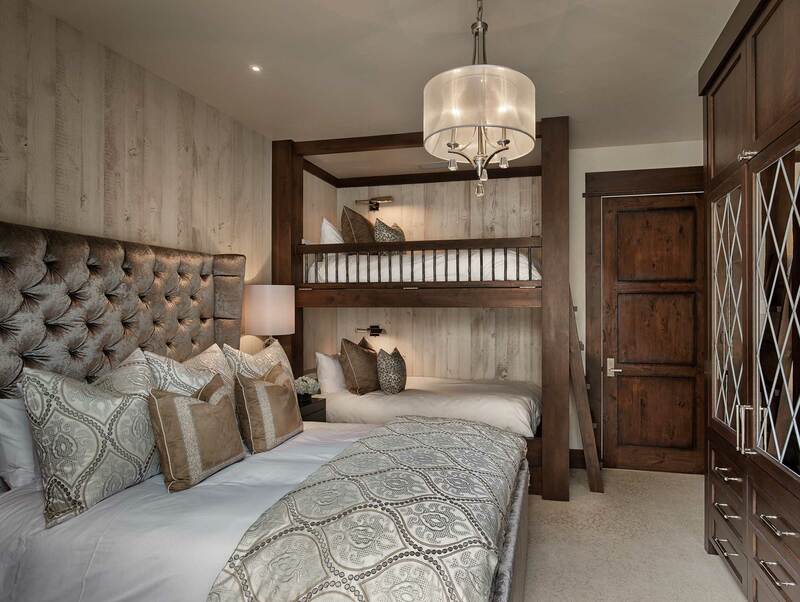 Moving into the private area of the home, stone and timber accents continue in each bedroom, repeated in different applications but mirroring the features in the main living area. In the master bedroom, the king-size bed is framed by a voluminous fabric headboard, again using materials in unexpected, subtle ways. Jerry likens the bedrooms to a Four Seasons hotel; tone-on-tone color makes the spaces feel large and luxurious. In the guest rooms, natural materials were incorporated into the ceiling to effect the illusion of volume. One of the rooms features bunk beds for families in order to maximize the small space and keep it versatile. Each bedroom has a private bath, also designed to create a sense of light, airy space by using glass tiles and polished travertine or marble. The result is a well-conceived retreat that offers all the amenities of a full-size mountain home. 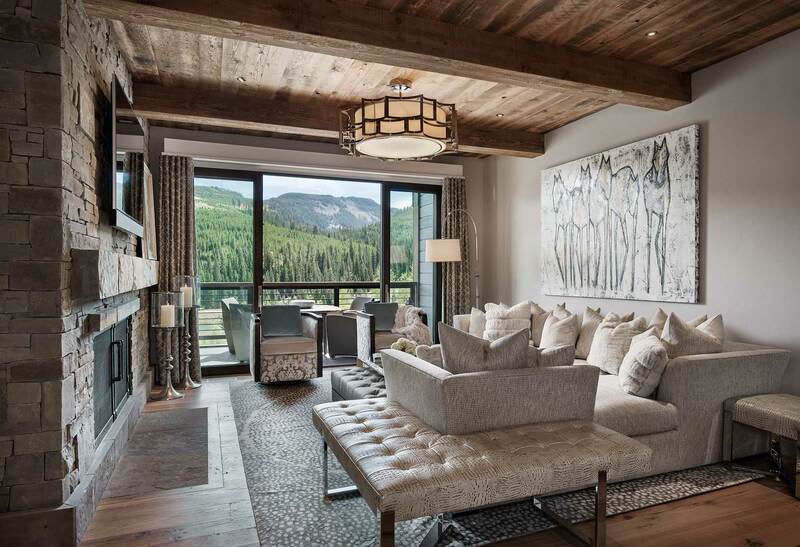 Combining rustic elements in a contemporary setting helped transform the condo into a “chalet,” as the Locatis refer to their getaway in the private Yellowstone Club village. A Carol Spielman painting hangs above the generously appointed, custom-made couch. In the kitchen, the warm white of Italian marble countertops and custom white cabinetry by Mountain High Woodworks lend a contemporary flavor to the condo. 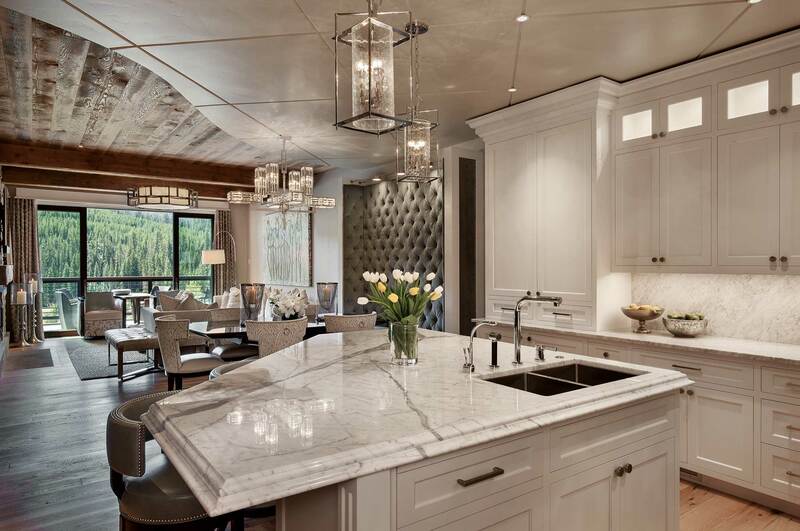 An asymmetrical floating island divides the kitchen from the dining area. 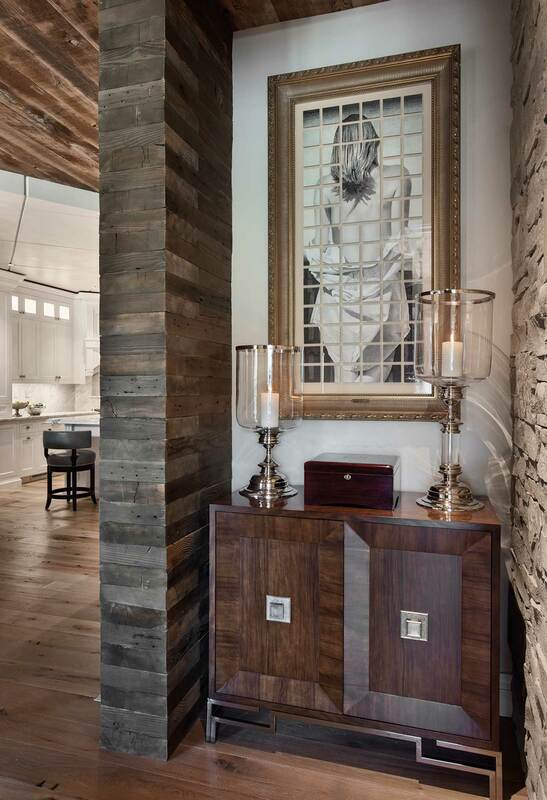 Reclaimed wood and stone in the living area set a precedent throughout the house. The guest suite features custom-built bunk beds as well as a king-size bed to maximize the private area of the home. The exterior facade of the condominium units belies the graceful elegance of the Locatis’s personal chalet inside. 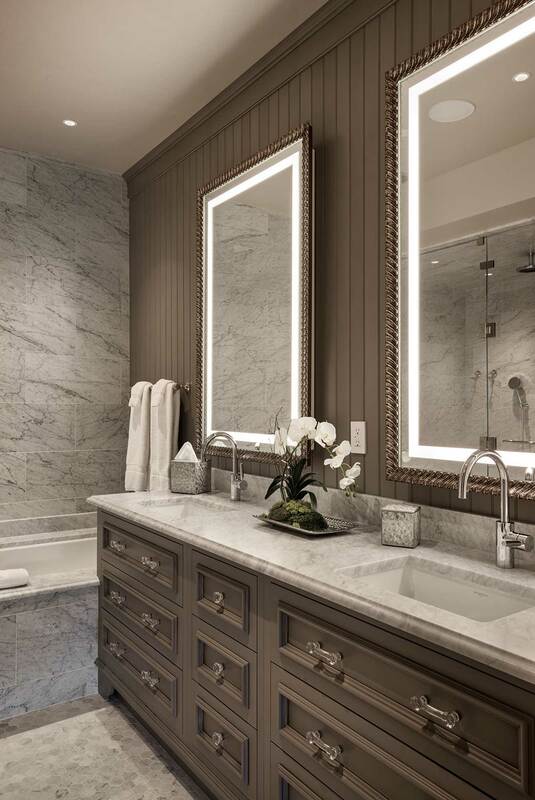 The master bathroom features Italian marble and a double vanity. 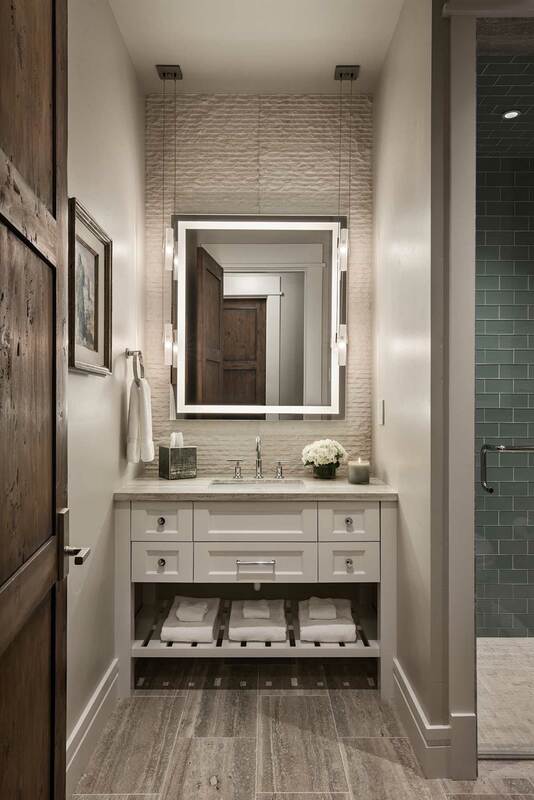 The sophisticated rustic theme carries over to the bathrooms where wood-inspired tile lines the floor and contemporary glass tiles enhance the walls.